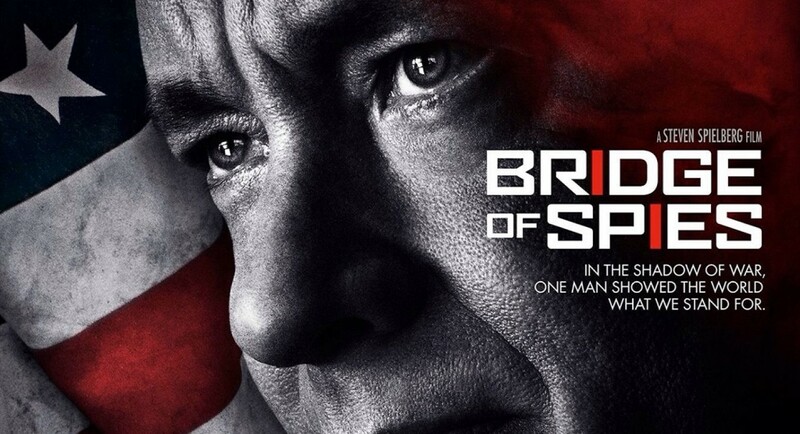 Written by the Coen brothers, based on a true story, directed by Steven Spielberg, and starring Tom Hanks, Bridge of Spies (2015) is a different sort of spy film. This is not the shaken cocktails, fast cars, and “femme fatales” of Ian Fleming's James Bond or the high-octane adrenaline rush of Robert Ludlum's Jason Bourne series. Bridge of Spies is a measured look at the more mundane side of international espionage. 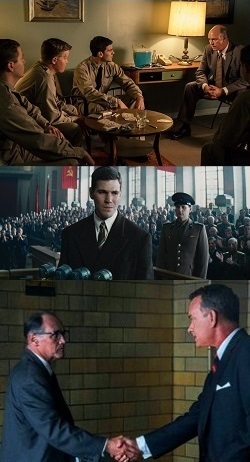 Set during the Cold War between the USA and the USSR this fact-based drama tells the story of an American lawyer, James Donovan (Tom Hanks), who becomes legal counsel for a Soviet spy, Rudolf Abel (Mark Rylance). As Abel's public defender, Donovan works to provide the highest possible level of due process for his Soviet client because for Donovan it would be un-American to do anything less. As the film unfolds the Soviets shoot down an American CIA U-2 spy-plane discovered in their airspace. Its pilot, Francis Gary Powers (Austin Stowell) is captured and imprisoned. Because of Donovan's involvement with the KGB spy he is approached by the CIA to help orchestrate a prisoner exchange between the Soviet Union and the United Sates. The complex negotiations take place in politically-volatile and Soviet-controlled East Germany. Usually films dealing with historical events and persons like to ratchet-up the tension and drama, however with this film Spielberg seems deliberately bent on defusing tension and drama. Unlike this summer's stylish Guy Ritchie spy flick The Man From U.N.C.L.E. 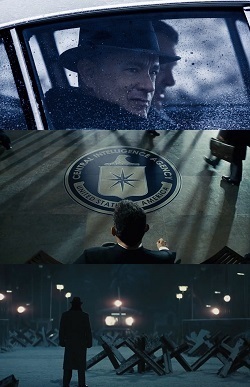 (2015) suspense and thrills aren't the name of the game in Bridge of Spies. Why? It’s not that Spielberg is a stranger to thrills and adventure; he directed critically- acclaimed blockbusters like Jaws (1975), Raiders of the Lost Ark (1981), andJurassic Park (1993), and even more serious films like his Oscar-award-winning films Schindler's List (1993) and Saving Private Ryan (1998)—just to name a few. Reflecting on Bridge of Spies it seems the film is less about a cat and mouse game of spy-vs-spy and more about a set of ideas. The first is identity. At one point Donovan, who is of Irish descent, is talking to a CIA agent Hoffman (Scott Shepherd) who is of German descent. He points out their differing ancestries and asks Hoffman, "What makes us Americans?" He proceeds to explain that it's the Constitution and the citizens’ collective and personal efforts to play by its set of rules. Over and over the film makes the point that sweeping under the rug the constitution and the laws flowing from it, even for popular and seemingly patriotic reasons, is un-American. Looking the other way on something because it isn't expedient or well-liked is dangerous to everyone. As a result Donovan, who is evangelical about America, works diligently to gift these principles and values to the Soviet spy Rudolf Abel, essentially rising to the occasion of loving his enemy—treating the Soviet spy the way he'd want an American spy to be treated if they were caught and detained. However, Donovan also suffers public backlash associated with his efforts to be faithful to the ideals of the American constitution. The film’s second idea flows from the first: When a person is pressured to abandon their faithfulness and buckle under the weight of public opinion they need to keep getting up when they are knocked down and take a stand for what they believe to be true. Donovan does this at every turn. This makes him a rather stalwart character and his approach to life often rubs judges and lawyers, cops and CIA agents the wrong way. 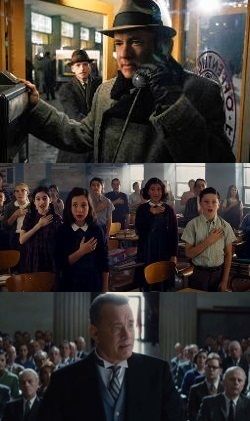 Bridge of Spies doesn't contain much in the way of obvious Christian content. Yes, Donovan prays a grace prayer with his children at the dinner table, and the CIA U-2 spy-plane pilots are sworn to such a level of secrecy that they are told not even to talk to the "Lord above" about their mission. Past these there is very little obvious Christian content. However, Christian viewers may want to consider redirecting the question Donovan asks: "What makes us American," and ask "What makes a Christian a Christian." What makes a Lutheran a Lutheran, or a Presbyterian a Presbyterian, or a Roman Catholic a Roman Catholic? How far away from the agreed upon confession of faith, how far away from God's Word can someone stray before they are in danger of not being what they claim to be. What is worth standing for when it comes to the Christian faith even while others are applying pressuring to abandon those values? When does a person say, "Here I stand I can do no other." Setting aside suspense and thrills Spielberg uses nostalgia to hammer home the ideas laid out in Joel and Ethan Coen's script. Every matchbook, TV dinner tray, and grocery store label is just right, along with the cars, airplanes and trains. For viewers who lived in the late 1950s and early 1960s the nostalgia itself asks the question, "Who were we then?" and "Who are we now?" As compelling as all this sounds, the major challenge when it comes to Bridge of Spies is that for some the film could easily feel boring and flat when compared to Spielberg's other films. In fact, it could also appear like Spielberg is playing it safe. The film is a solid piece of storytelling—even if it comes across like being told to eat all the vegetables off the plate before being excused from the table.